Menus present customers in locations such as restaurants and bars with a selection of available foods and beverages the host establishment has available for serving. 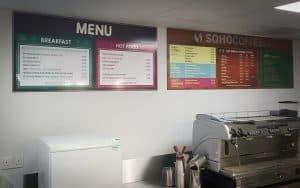 Traditionally a menu typically comprised a printed card but more recently menus are printed or painted on walls, boards, free-standing signs and other such structures. A menu board is known which uses mixed media to very creative effect in presenting customers with available options. The menu board comprises a frame bordering an area of print containing illustrations of food items. Also within the bordering frame is an area comprising a specialist material that is receptive to chalk markings. The menus is thus able to display both permanent printed illustrative items and variable texts in chalk. Menus very often must accommodate rapidly changing items, for example “specials” or items with seasonal or limited availability. In such situations, a specials board may be used an this very often includes a specially fabricated surround bordering a temporary printed list. Digital menus are well known and increasingly used, for example in fast food outlets. These comprise flat-panel screens, usually in an abutting array, upon which is displayed pictures and text comprising a menu. The display can be animated to make the product offering more enticing with cinematic devices such as zooming and panning being used. The content displayed by digital menu screens is typically deployed wirelessly. Information can be narrow-cast to an estate of screens and so the offer can vary from location to location. Such displays have benefitted from advances in display technology and are bright enough to display a menu in a well lit area. They have yet to penetrate more traditional establishments where printed articles are felt to be more in keeping. A menu for a pub or restaurant is often displayed outside the establishment and so menus capable of withstanding exterior conditions are known.